The Surge is a futuristic action game in the vein of Dark Souls that pits players against a host of robots and power-suit-wearing goons. It’s fun to bash on zombies but even better to cut their limbs off to steal their loot. Item acquisition in Souls-like titles tends to be abstract. You wail on a zombie or demon for a bit and if you’re lucky, they drop a shiny pick-up that could be any number of things. It’s a dice roll whether get a new weapon or not. In Dark Souls, the small, ethereal bag of loot that falls to the ground is mysterious. In the Souls-ish Nioh, the colorful burst of multicolored drops feels in tone with the game’s energy. But The Surge (out now on PS4, Xbox One, and PC) takes another route that might be the best attempt yet at making loot feel meaningful. 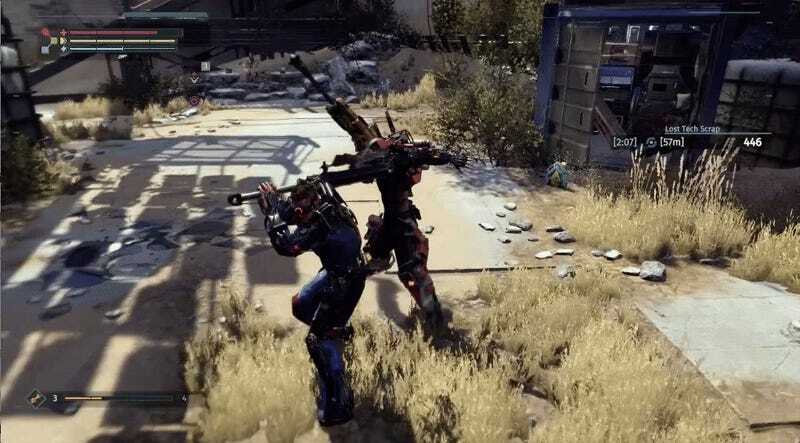 In The Surge, you have the ability to focus attacks on certain body parts. Continue to attack a specific limb and you can trigger a powerful finishing move to slice them off your foes. It’s more than an exciting bit of blood and mayhem; it’s also how you get new items and equipment. Do you want that enemy’s nifty chainsaw arm or powerful hammer? Cut it off and get the schematic to craft for yourself. Dark Souls would occasionally allow players to cut off enemy limbs to get unique weapons, but The Surge takes that idea even further, allowing you to dismember pretty much any enemy in the game. Thanks to this little piece of design, the world feels solid and real. You can break and smash it for your benefit. The Surge has a speedy approach to combat that can move a little too fast from time to time but the way it handles loot is incredible. Slicing and bashing new gear from enemies is a distinctive touch that keep combat exciting and makes the world a little more extant.